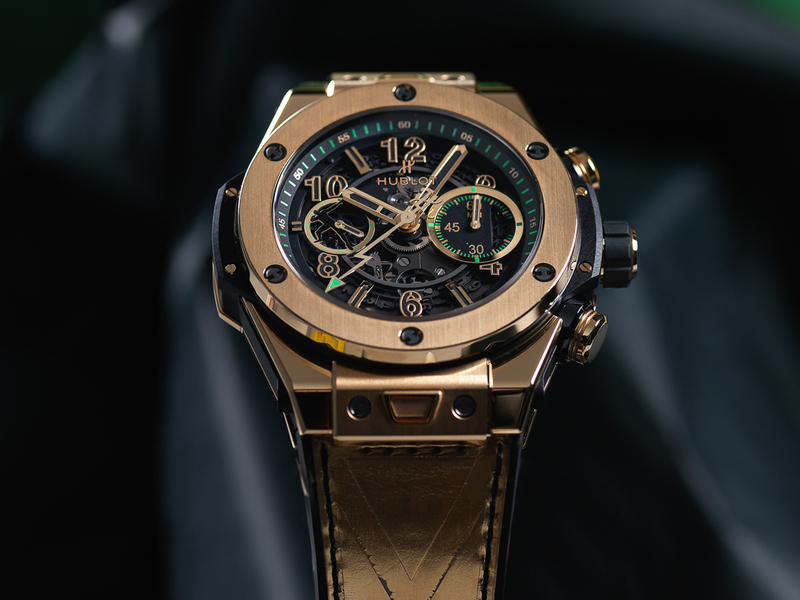 With an effortless ability to succeed, Usain St. Leo Bolt is a 21st-century King Midas, achieving gold time and again, in a way the world has rarely seen. The fastest man in history with a 100m record of 9.58 seconds, the 29-year-old Jamaican is the greatest sprinter of all time. At the 2008 Beijing Olympics he became the first athlete ever to win consecutive gold medals in the 100m and 200m plus the 4X100m relay. But Bolt went from a super-athlete to true legend when he successfully defended all three Olympic titles at London 2012. When he won three more golds at the 2015 World Championships, Bolt became the first man in any discipline to complete a “triple-triple”, making him the most successful athlete in the history of the IAAF athletics world championships. 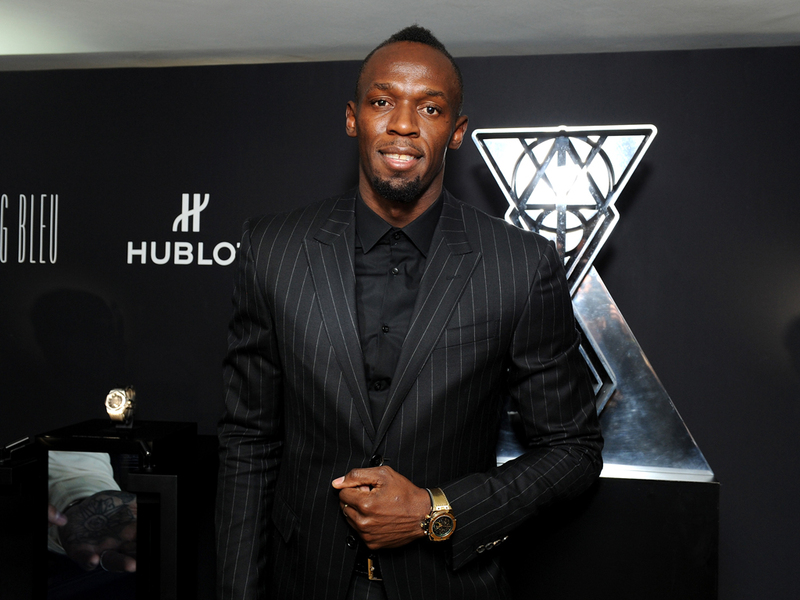 A Hublot ambassador for the past five years, the brand has chosen to mark Bolt’s sporting achievements with the release of two limited-edition Big Bang Unico Usain Bolt watches – both 45mm, one in black and one in his signature colour: gold. 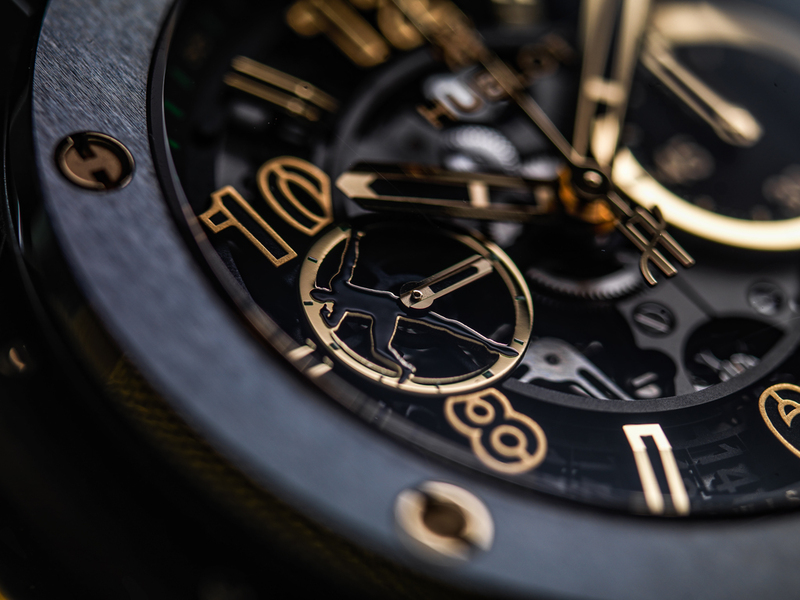 Limited to 250 pieces, the black watch is in polished and satin-treated ceramic, the bezel featuring Hublot’s signature half-dozen H-shaped screws in yellow gold. The skeletonised black dial has a “Lightning Bolt” chronograph hand operated by the automatic HUB1242 Unico in-house movement with 72 hours of power reserve. 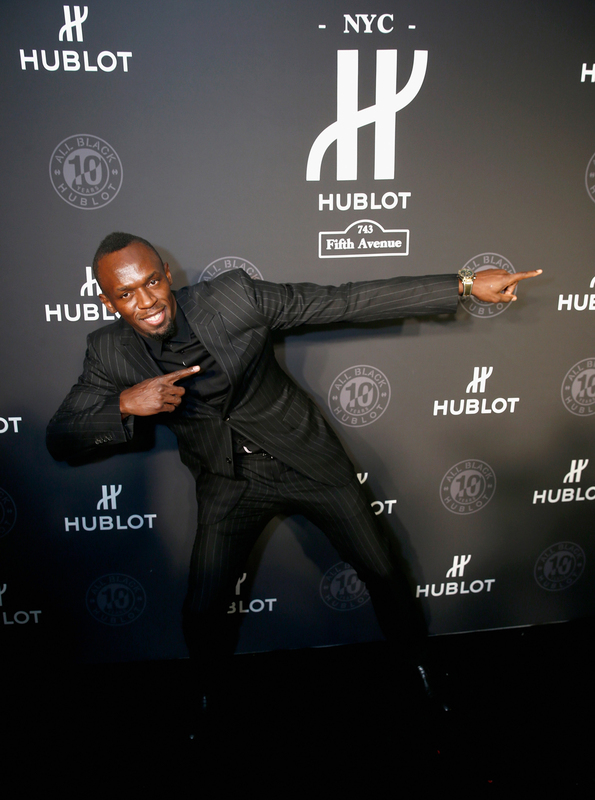 The piece de resistance, however, is the watch that Bolt himself wears. 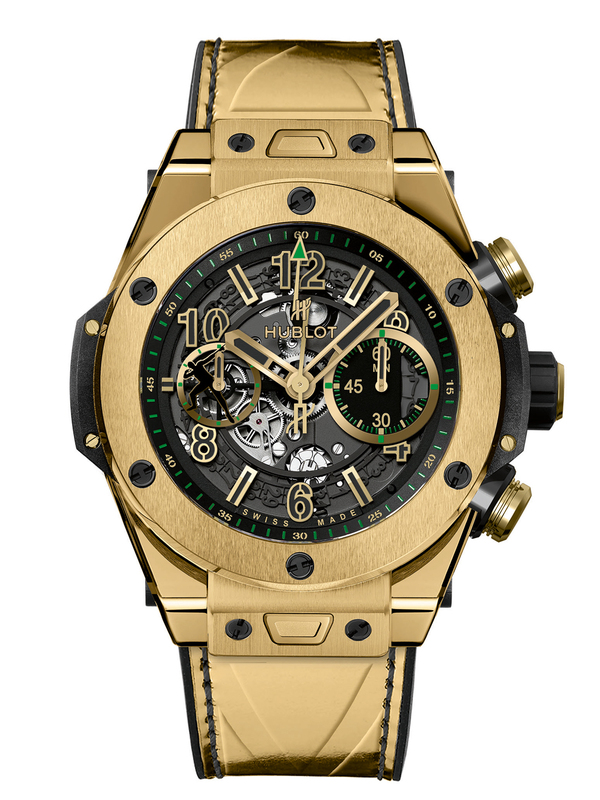 Standing at 6’5”, Bolt is one man that can carry off a big, in-your-face timepiece and the Big Bang Unico Usain Bolt Yellow Gold is certainly that. Limited to just 100 examples, the case is in matt yellow gold perfectly contrasted by a black skeletonised dial. 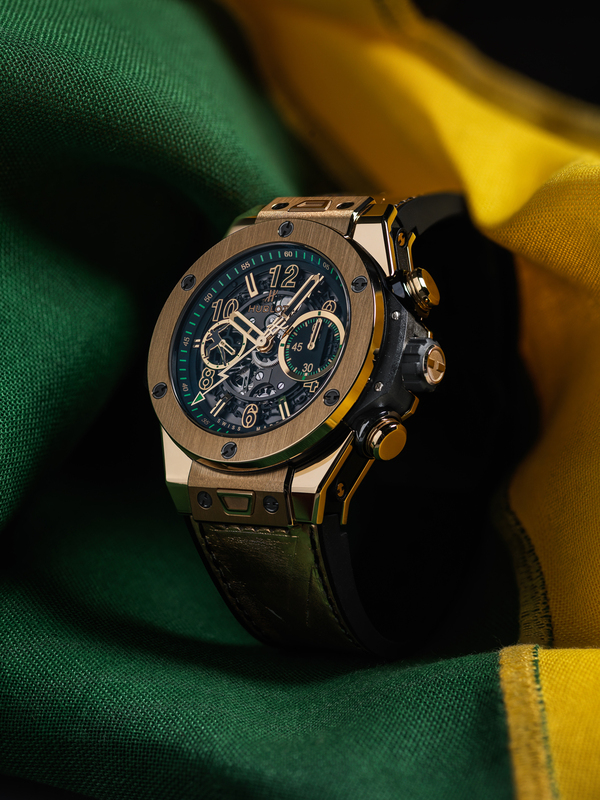 The best touch of all though comes through the fabulous metallic gold leather strap – straight out of Studio 54 – embossed with the Jamaican flag. 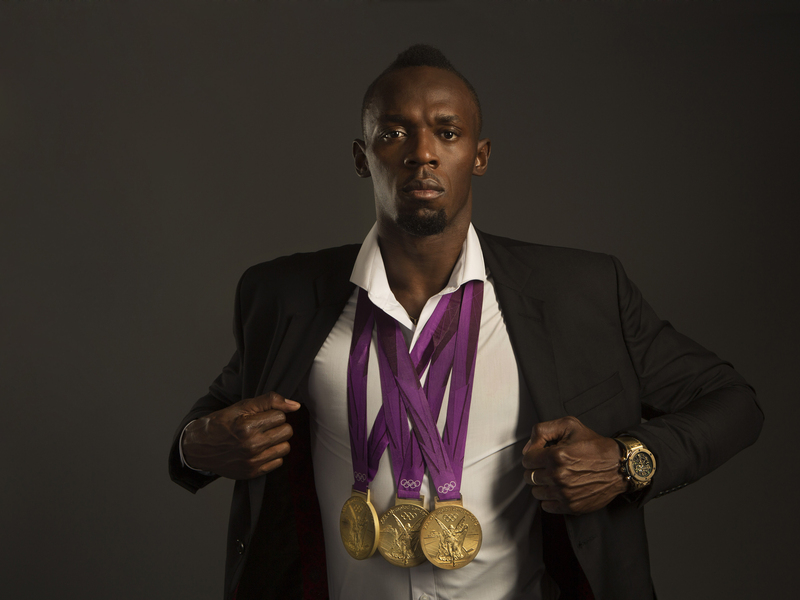 “Yellow gold is hot,” Bolt explains. “Hublot asked me what I wanted from a new watch and I said ‘I want it to pop’ and they said ‘OK, we’re going to make it pop’. And, hey, they definitely made it pop! 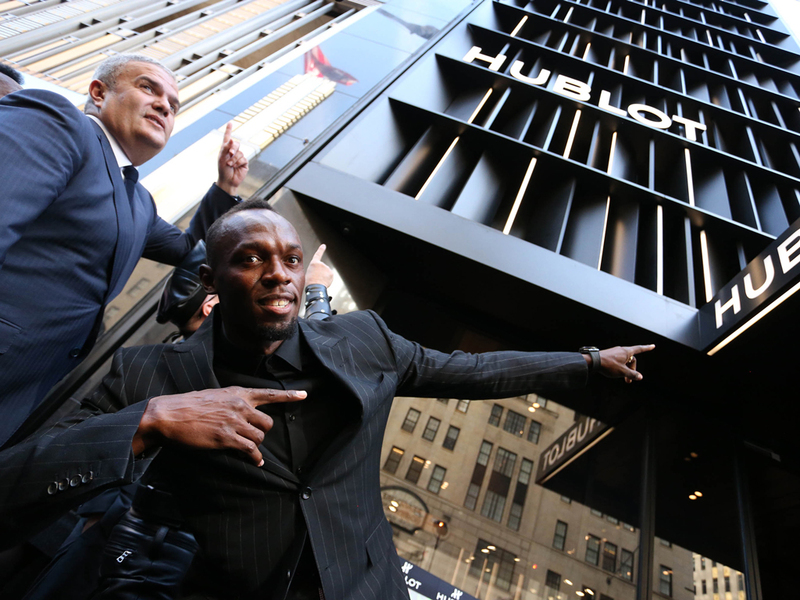 Looking at Bolt, dressed all in black, his Hublot stands out like a beacon, emphasising one of the main reasons Chairman Jean-Claude Biver and CEO Ricardo Guadalupe chose to work with him: his flamboyance and energy have brought track and field to a new audience. 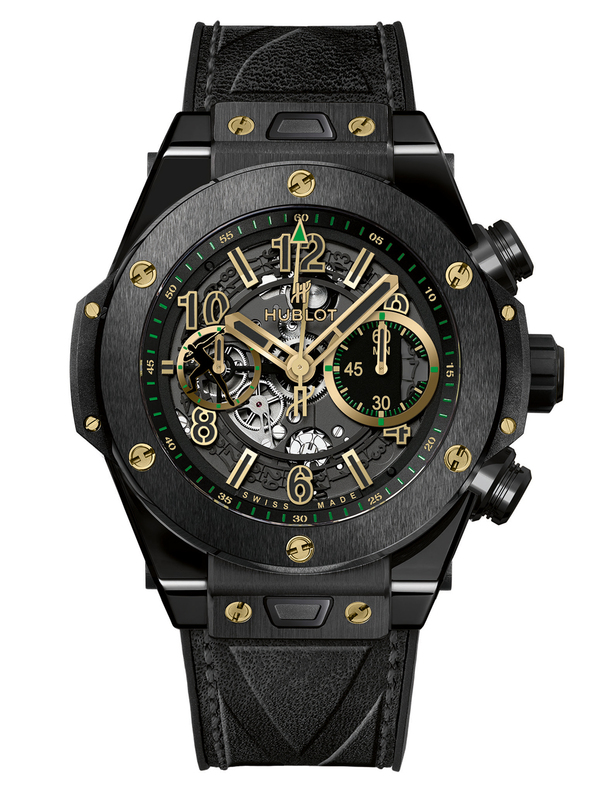 “This is what I love about Hublot. They’ve really partnered with a lot of guys and with all of them they’ve really tried to bridge a gap, choosing great communicators and reaching many different walks of life,” Bolt says.